Here on Ye Olde Guest Services Bloge, we tend to focus less on superfluous old English “e’s” and more on the nuts and bolts of how to make your guest services team function like a well-oiled machine. That means that we’ve discussed things like your seating team in great detail, including how to get people to move down front and ten ways to make your seating team more effective. But there’s one practical seating tool that we’ve danced around without ever really discussing. That, my friends, ends today. If there is a faithful friend to guest services practitioners, it is the long-suffering pipe and drape. P&D covers a multitude of sins. Your church meets in an ugly middle school cafeteria? Boom: pipe and drape the walls. You need to section off a classroom? Pow: throw a run of pipe and drape across the middle. Want to create an artificial backstage area without breaking out the sheetrock? Blam: toss up that 12 foot section and get yourself a green room (just keep it down while slurping your coffee, because fabric ain’t sheetrock, kids). But my favorite use of pipe and drape actually separates the dynamic duo. Yes, we’re talking Batman without Robin, Laurel without Hardy, and Mac without Cheese. Let’s talk about piping your seating area. If you struggle with (a) filling your auditorium, (b) filling your auditorium unevenly, or (c) leaving space for late arrivers, piping off an area is an easy way to section seating and help your volunteers keep their sanity. We’ve run the gamut of tools over the years: nylon ropes, signage, retractable stanchions, even eight feet tall pipe and drape that actually felt more like a haunted house. But my favorite go-to is the three feet high pipe, sans drape. Here’s why I love the three feet high option: unlike rope or retractable barriers, you can’t easily step over or duck under those metal pipes. They’re by no means heavy, but they’re quite unwieldy for a ne’er-do-well who might want to sit in a no-no zone. 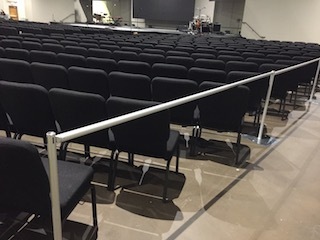 Both the uprights and the horizontal supports are lightweight and easy to remove when a section is ready to be seated. The bases are necessarily heavy, but have a handy notch that fits snugly around the leg of an auditorium chair, thereby preventing tripping hazards. All in all, it’s a clean, slick look that helps naturally funnel people where you want them to go, rather than allowing a Lord of the Flies-style seat yourself free for all. If you struggle with a serious seating situation, get yourself some pipe and see where that takes you…and your people. Disclaimer: FTC watchdogs will probably want to know that the companies listed / linked above did not ask for this endorsement, nor did they provide me with free swag in order to do so. I’m just a really satisfied customer who wants to let you know where you can get some great products. So there. Thanks for the recommendation for Georgia Expo! Just ordered some pipe and drape for a visual barrier today. Thrilled that I could order BLACK poles and bases (verses buying covers that were black). Comparable price and good service so far!